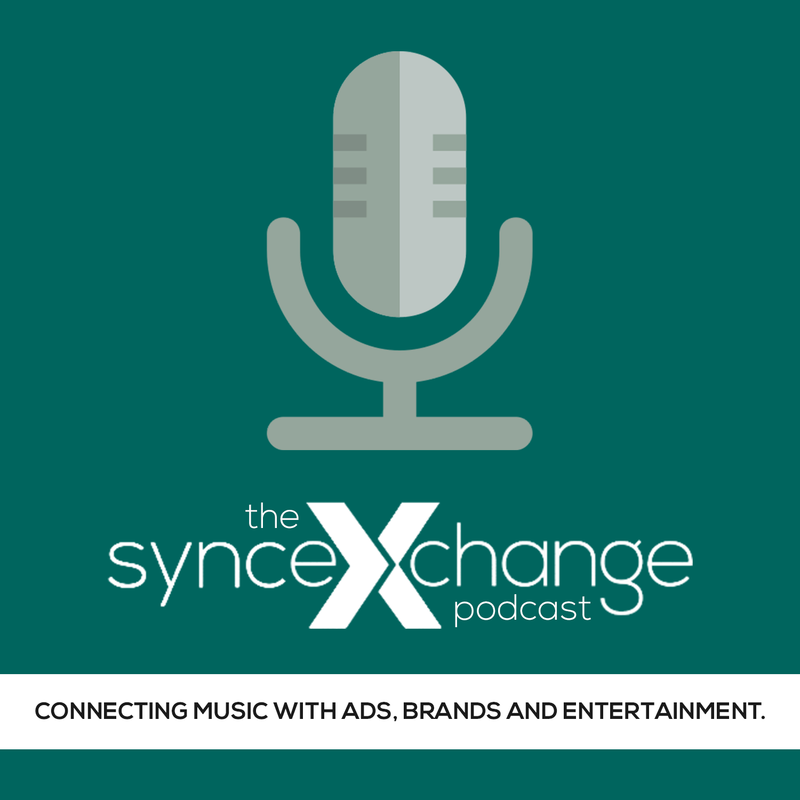 This article is the first in a series (“SyncTech”) profiling companies and services that help people working in scoring, licensing and placing music for ads, branded projects, visual and interactive media. Today we’re going to breakdown how Audiodraft brings together buyers and sellers of music for visual, interactive, branded and advertising projects. Audiodraft is an Internet-based music marketplace for custom music and audio connecting over 20,000 artists, sound designers and producers to music supervisors, creators and projects in advertising, film, TV and interactive media. Current high-profile clients include an impressive roster of brands brands like Nokia, Red Bull and Marimekko, ad firms like and Saatchi & Saatchi as well as Radio/TV stations like Europe’s The Voice. So why are these companies using Audiodraft? Simply put, it elegantly uses the power of the Internet to solve a real problem for music buyers – how to simply, quickly, efficiently, economically find music for projects. As for music creators, producers and composers, Audiodraft provides them a unique way to find new markets and clients for their music on a global scale – something impossible through traditional production houses and agencies. This was what the Internet was built for – bringing together massive groups of like minded people to connect and do business – in this case buyers and sellers – independent of region and based on interest and need. 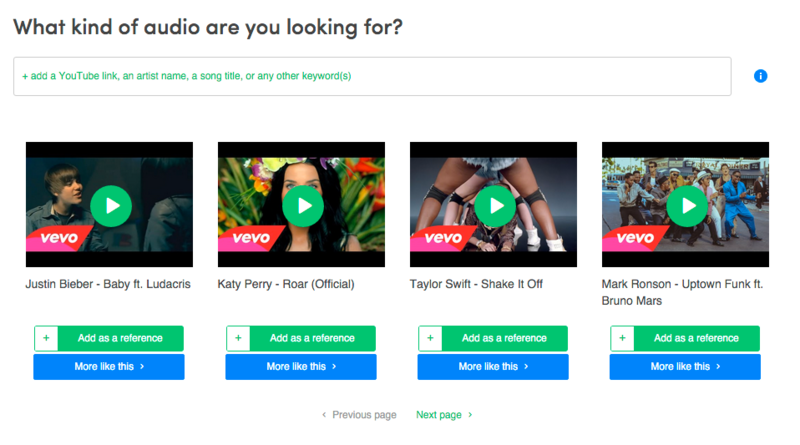 In my opinion, Audiodraft represents an important evolution in the music and media marketplace because it’s created a better marketplace for custom music. Let me explain why this is so important. Many times, as a buyer, and I’m speaking from experience as a former ad producer, it’s the norm when you’re producing an ad or are charged with finding custom music for a project you’re working on, that project has built-in limitations of time and money. And this limits your ability to discover and secure the perfect music for a project. The fact is, in the majority of cases, from the point of view of the producer or creative director, music is a much lower priority in comparison to ensuring a successful shoot, proper editing and post production. And, this means the people responsible for procuring music – whoever they are – usually don’t have the time and budget they need to find and secure the perfect music for a project. As a result, compromises have to be made to close out a project on time and on budget, and this means quality can suffer or producers will go back to the same resources again and again. And that’s just if you’re looking for one piece of music. Now, imagine if you’re at a major studio or ad firm that commissions literally hundreds of songs and cues a week: the time spent discovering, negotiating and finalizing custom music with a limited budget of time, energy and money can be a daunting, expensive, time consuming task. And, if the deadlines and budgets become too challenging, many times a producer, creative or music supervisor will be forced to dispense with the idea of using custom music entirely in favor of quickly pulling lower-quality music from a stock library. 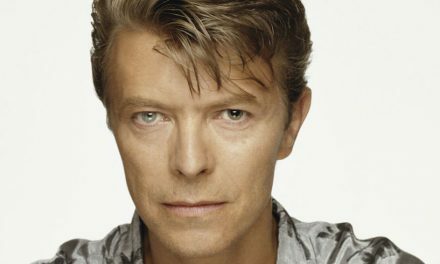 This is when Audiodraft really shows its value to the buyer by providing a viable alternative to anyone looking for high volumes of high-quality custom music for their projects. 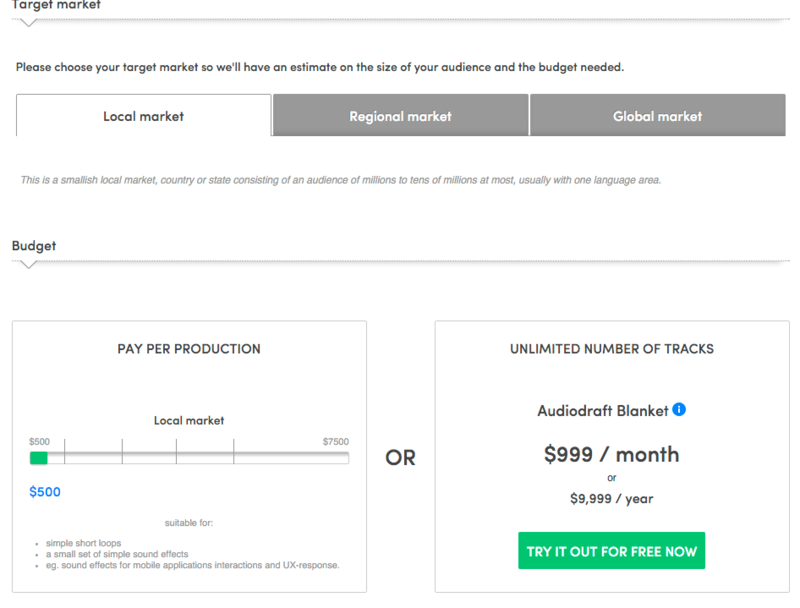 In terms of pricing and timing, Audiodraft guarantees buyers can discover, edit and secure large volumes of high-quality custom music within 48 hours, with payments on a per-item (for low-level users) or for high-volume users like agencies and studios, a monthly fee for unlimited access to custom music through a dedicated online studio. Imagine that – for a price that’s less than licensing two songs (10K per year for unlimited usage and $500 and up on a per usage basis. ), an ad firm or studio can get unlimited access to as many custom songs as they require. And this gives you, as a producer, creative, brand manager or music supervisor, a real edge in terms of quality and budget in comparison to other ways to find and get music for projects. It makes your job easier and the ultimate product better. As for the artist and sound designer, let’s put it this way – what other network gives you access to a worldwide pool of major brands and music buyers constantly looking to place music for projects from some of the world’s largest brands and entertainment projects? So how does Audiodraft work? In this article, we’ll go through the buyer process step-by-step (the next article will go through the seller/creator process). There are two types of buyer scenarios, the custom agency studio for high-volume buyers from ad agencies and studios, and the open studio for those looking for an individual song for a project. 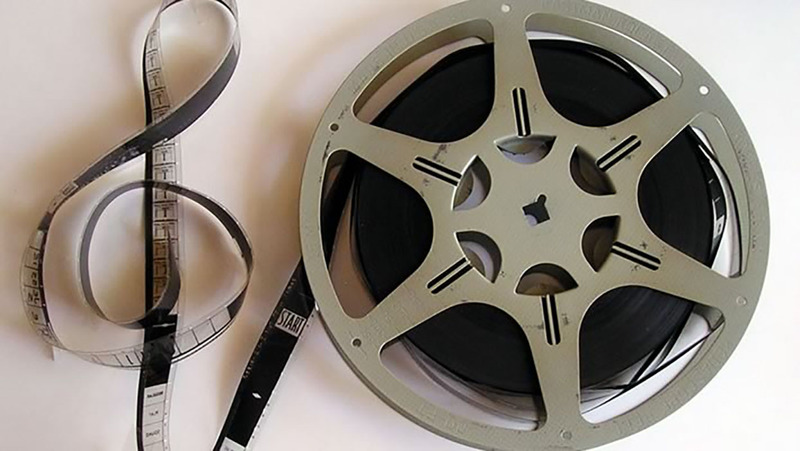 First, let’s break down how Audiodraft works for a high-volume user like an ad firm or studio. 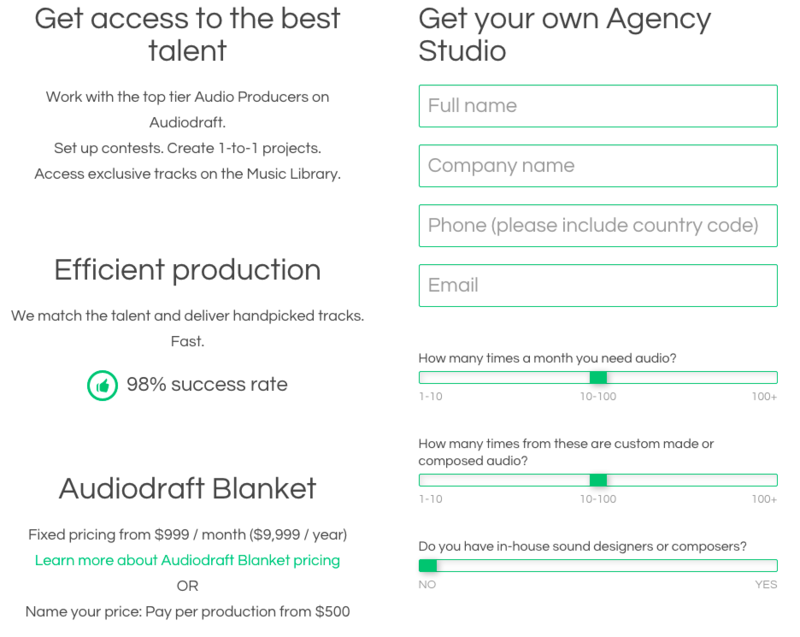 The first step is to request a Agency Studio from the Audiodraft site. It’s a simple process where you put in some basic info like your contact info, how many pieces of music you use monthly, the amount used that’s custom versus licensed and whether you use in-house composers. After you fill in this screen, Audiodraft will get in touch with you to quickly set up a agency studio for your company. Now your agency studio is set up, you sign in and go to a welcome screen. From here, you can go into a dashboard, look at current productions, add users from your company who will collaborate on the project or submit their projects and most important, let you quickly get to work on creating a contest for your brief. The contest model is how briefs are created, organized, then sent out to composers and sound designers in the Audiodraft network. Basically, your brief becomes a contest for the composers that agree to meet your unique criteria of time, type and budget. Let’s go through the process – online, it takes about 10 minutes from start to finish. Step 1: Defining the audio you’re looking for. The challenge here that Audiodraft helps you solve, and I think it solves it well, is how to communicate quickly and simply the kind of music you’re looking for to potential composers. It does this by prompting you to enter a name of a band, mood or genre of music, which then prompts you to select choices from a drop-down menu. 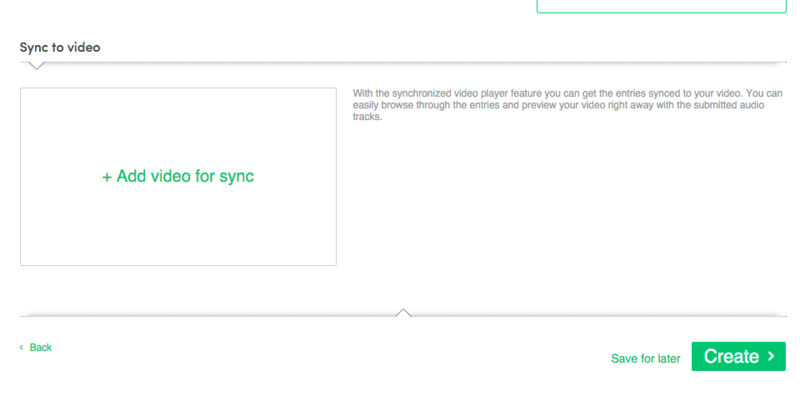 From there, you get a series of YouTube videos you can select from that convey the music direction you’re looking for. What I like about this is that it allows composers to both hear and see what it is you’re looking for, and you can refine choices through adding as many keywords as needed. Next, you add keywords and tags for genre, type of mood, BPM, feel and other indicators like instrumentation and sound that help Audiodraft with the composer selection process and at the same time help the composer get further information and refinement of exactly what kind of music you need for your project. You can add as many keywords and tags as you want to customize what you are looking for and what you need. The next step if to define the brief, cost, timeline and license. Step 3: Creating, describing and reviewing your brief. 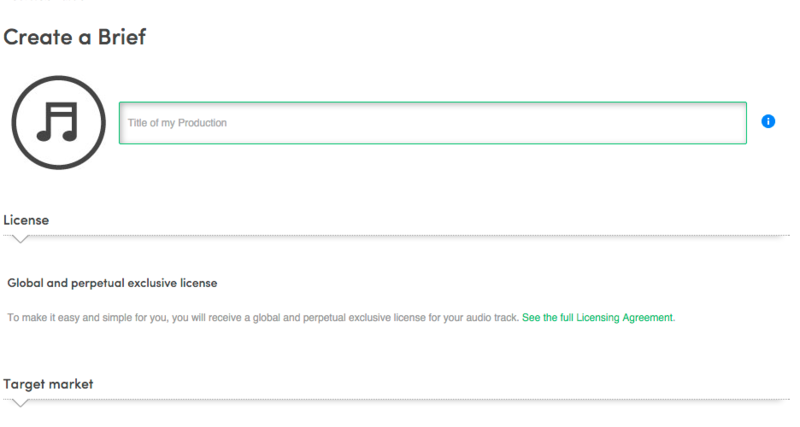 Here’s where you enter the vital information for the actual brief, including the name of the production, the title of the brief, the market size you’re looking for (local/regional/global) and whether you want to pay per production or if you’re opting for an unlimited amount of tracks (in my opinion the better one because you can get as much as you want and cancel at any time). Note that all licenses are global, exclusive for all uses and are in perpetuity, so you don’t have to worry about any conflicting current or future IP issues. Finally, you put in some vital statistics to define the contest for the brief, i.e., how many submissions you’d like to receive in total, track length, the day/time for submissions and a summary of references, links and tags. And that’s the submission process. Now you just sit and wait. Actually, what happens next is the cool part, your brief and all the particulars you’ve entered goes out to Audiodraft’s team, who then use the parameters you’ve set up for your project to connect it to potential composer. Then, you’ll start to receive notices via email and in your studio when music comes into your agency studio for evaluation, and if you find it interesting, further refinement and final selection. What you get here is a summary of your brief, along with the music that has been submitted for your contest to fill your brief. 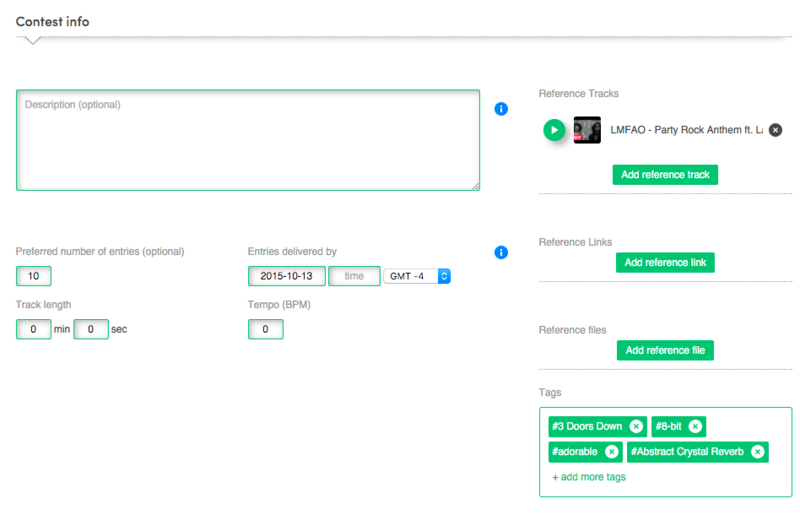 As you can see from the above screenshot, you can easily listen to tracks, rate them, see who created them, share them with your peers and others working on a project, and most important, contact the creator to request further refinement. Then, once the selection and iteration is done, you can select the track you want, receive a high-quality WAV file for use, close out the project and move to the next task at hand. I seriously wish I had Audiodraft at my disposal when I was producing ads. Not only is the whole process incredibly efficient and fun, with over 20,000 creators, Audiodraft has a number of people on tap that can fulfill almost every type of brief, every type of music and every type of usage case you can imagine. Personally, I’ve been a fan of the service since my friend Tom Ryan, former head of digital at EMI (and full disclosure here, Audiodraft board member), turned me onto the service in May 2013 because I instantly saw its potential to solve a real problem for buyers and sellers, how to connect, discover each other and do business better. And, if you want to try out Audiodraft’s agency studio solution, there’s no better time than now because they’re offering a 25% discount on individual projects or their monthly unlimited plan. Just go to https://www.audiodraft.com/agency-studio/ to get started. 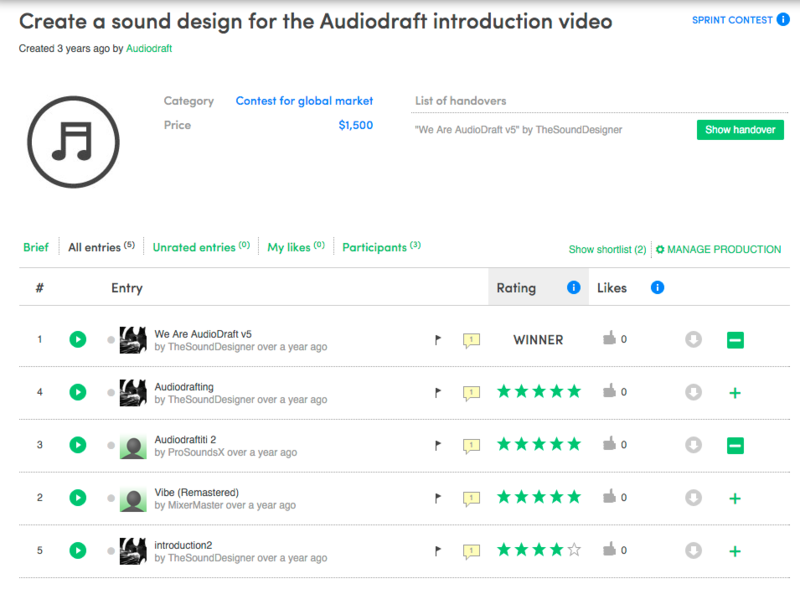 Next week, we’ll detail how Audiodraft works with creators, composers, sound designers to get them discovered, helps them to make submissions for projects and gets them paid. NextSyncDeals, Vol V. Getting a Good Rep.